Pokey Heads, also referred to as Pokey Sprouts or just Pokeys, are enemies appearing in Super Mario Sunshine, Super Mario Galaxy, and Super Mario Galaxy 2. They are similar to a standard Pokey, but include only the head, hence their name. They are not to be confused with ordinary Pokeys that have been reduced to merely a head, as those typically act the same as regular Pokeys. In Super Mario Sunshine, they have goofy faces, thorns resembling stubble, and are yellow. They appear primarily in Bianco Hills, where they disguise themselves by burrowing among the many pink flowers of the area. They can be told apart from a distance by the fact that spraying them from a distance causes their flowers to open and close very quickly, instead of staying open longer, and that the Pokey Heads do not make the same singing sound that the flowers do upon being sprayed. They quite often appear among the flower rings that award Mario with coins for spraying all the flowers within a few seconds; the Pokey Heads do not count in these. Once approached, the burrowed Pokey Head will burst from the soil and slowly hop in Mario's direction, and will continue to do so no matter how far away he gets. They can be defeated in multiple ways; they can be jumped upon, giving one coin, or sprayed into a wall, causing them to flatten with a splatter of brown goop, which gives Mario 3 coins. Knocking them into any body of water will not reward Mario at all, but will still defeat the enemy. They later appear in the Red Coin Field, where they carry Red Coins. Defeating them here will replace one of the coins with a Red Coin, but causing one to fall off the edge will render the location unwinnable unless Mario starts over. In both locations, they appear along the blue Seedy Pod variety. They are actually larger in this game than the individual segments of the game's standard Pokey. In Super Mario Galaxy, numerous Pokey Heads appear in the Gusty Garden and Dusty Dune galaxies, where they act mostly the same as the ones in Super Mario Sunshine. They are now green, have the same face that standard Pokeys have used since Mario Kart: Double Dash! !, and lack thorns entirely, instead having small black spots. Due to the fact that no non-Pokey flowers resembling theirs can be found, they are not as well hidden, with the tops of their green heads being visible while they are burrowed. At the beginning of the second mission of the Dusty Dune Galaxy, Blasting through the Sand, five Pokey Heads appear in a circle, similar to in Super Mario Sunshine, and defeating all of them causes the game's only regular Pokey to appear. In this game, getting attacked by a Pokey Head causes one to hop joyfully for a few seconds. In this game, jumping upon or spinning them instantly defeats them. In Super Mario Galaxy 2, they are much rarer, only appearing in the Slipsand Galaxy, where they appear burrowed into a floating stream of rapidly-moving quicksand, mostly in an area near a Fire Flower that can quickly defeat them. They follow the same attack pattern as the previous games, and look as they did in Super Mario Galaxy. They are the only variety of Pokey in this game. Due to this game coming out after New Super Mario Bros. Wii yet still using assets from Super Mario Galaxy, the Pokey Heads in this game are the last Pokeys overall to use the floral design. The overworld sprite of Pokeys in Mario & Luigi: Partners in Time appears similar to a Pokey Head. ↑ Browne, Catherine. 2010. Super Mario Galaxy 2 Prima Premiere Edition guide. Page 29. ↑ Hodgson, David S J, Bryan Stratton, and Stephen Stratton. Super Mario Sunshine Prima Official Strategy Guide. Page 17. ↑ Shogakukan. 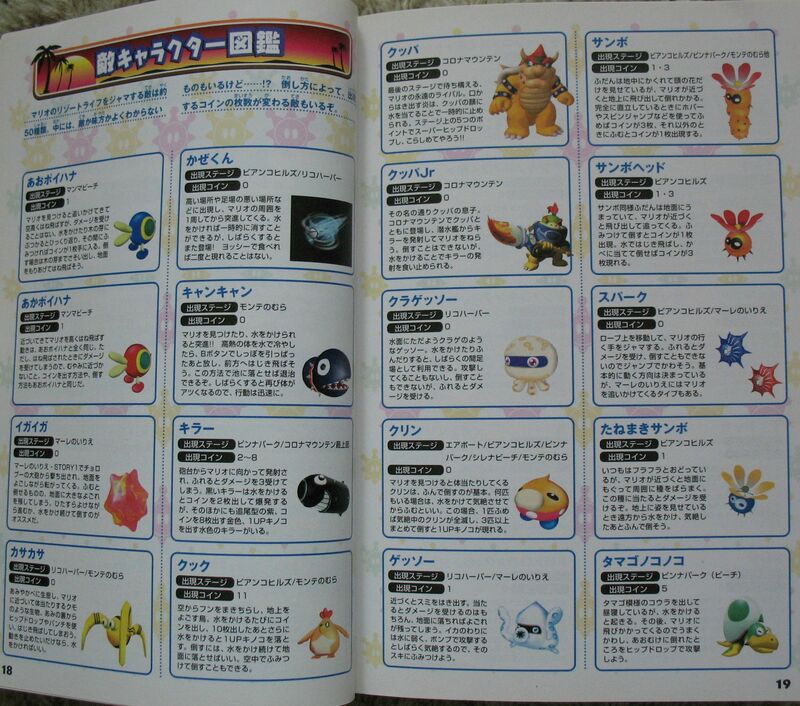 「スーパーマリオサンシャイン任天堂公式ガイドブック」 (Super Mario Sunshine Nintendo Kōshiki Guidebook). Page 19. This page was last edited on January 31, 2019, at 17:48.